You might look forlornly at your showcase of pearls as you polish the glass, perhaps noticing there are fewer pesky fingerprints on that particular case. We don’t see a lot of excitement about pearls these days. The showcase where you keep your pearl merchandise is definitely not the one with lineups two deep, necks craning to see the treasures within. Consumers look at pearls as ‘grandma’s jewels.’ Perhaps their grandmothers had graduated strings of pearls. Likely, grandma treasured those pearls and wore them almost all the time, and never was it the wrong moment to put on her glistening miracles from the ocean. Pearls may be the oldest gem in the world. You might imagine a prehistoric cave dweller chomping down on a recently collected oyster, and after breaking a tooth, looking at the round, lustrous orb, rolling in the palm of an outstretched hand. If it was me, I’d be heading back to the beach to dig out some more of the shells to find more pearls. Pearls are just about the only gems that are ready to use as soon as they are collected. That is why they are considered older than other gemstones, which have long been used in their rough state, but, it seems, only used for ornamentation later in history. We still see natural pearls that formed by pure good luck. This occurs when some irritant gets through to a shellfish and the shellfish coats it, layer by layer, with its shell material, like a snowball rolling down a hill gathers layers of snow. The longer it continues, the larger the pearl grows. Natural pearls are very rare, and they have, historically, been the territory of the wealthy and of the royal houses of the world. There have never been enough to fulfill the needs of the wider gem market. Natural pearls have traditionally been collected in the waters of the Persian Gulf, as well as those around Japan, India, and Sri Lanka. They are still harvested today, but in very tiny quantities due to their very high cost and the fact they form rarely, by pure happenstance. The traditional source of pearls is oysters found in saltwater oceans. However, there are other sources as well. If you’ve been to Barbados and enjoyed a conch chowder, that remarkable spiral shell may have housed more than just your supper. Conch pearls are often bright pink, beautiful to look at, and quite rare and costly. People have collected pearls from freshwater rivers and streams around the world, too. This has gone on for millennia. I recently read a Victorian novel that referred to the tragic loss of a strand of Scottish “river pearls.” These would likely be natural pearls found in clams in the cool waters of a Scottish river. Quahog pearls are a rarity found in quahog clams in New Jersey and along the temperate eastern seaboard of the United States. These pearls are dark purplish colour, and are also very rare and valuable. Most quahog clams do not produce pearls. A pair of long cultured pearl necklaces by Secrett circa 1965. These days, cultured pearls are the standard available in the market. At the beginning of the 20th century, the now-famous Kokichi Mikimoto patented the process for culturing pearls. The well-known culturing process involves the insertion of a bead of mother-of-pearl cut from a shell, along with cells of the shell-making tissue of an oyster, into another oyster. The hoped-for result is the bead ends up being coated with layers of iridescent ‘nacre.’ The smoothness, colour, and lustre of the nacre will determine the quality, grade, and value of the pearl. A high percentage of pearls do not come out well, so lots of pearls have to be cultured to produce a few specimens of gem quality. Japan has traditionally been the producer of cultured pearls and was really the only source for the better part of the 20th century. Later in the century, we saw growth in ‘farming’ cultured pearls in warmer climates, generating new sources. Larger South Sea cultured pearls also began to be produced in areas such as Northern Australia, Indonesia, Vietnam, and other locations (including Tahiti, which is famed for its black pearls). South Sea cultured pearls are now available in white, gold, brown, black, and tones in between. Also, these cultured pearls can be produced as large as 20 mm (0.8 in. ), if you can imagine! South Sea oysters are a lot larger than the traditional akoya oysters used for culturing in Japan. Due to the size of the Japanese oyster, we will never see the traditional cultured pearl exceed 10 mm (0.4 in.) in diameter. Market pressures due to high production and reduced demand have seen the price of South Sea cultured pearls drop deeply in the past decade. 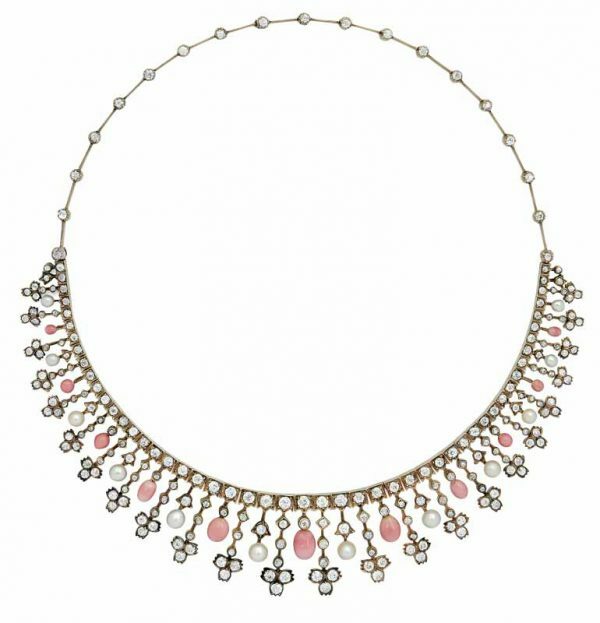 A necklace of really fine South Sea pearls is more affordable than ever. By the 1970s, a new source of pearls had appeared. Curious Japanese pearl farmers wondered whether culturing pearls in freshwater lakes and streams could be successful. The outcome was beautiful gems from places such as Lake Biwa in Japan. Cultured freshwater pearls from this lake were bright, lustrous, and of subtle pastel colours. 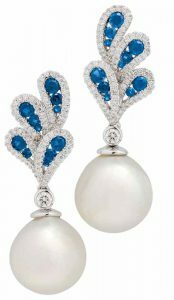 A pair of South Sea cultured pearl, sapphire, diamond, and white gold ear pendants. This was the beginning of a huge change in the production of cultured pearls. Over the past few decades, more and more cultured pearl sources have been established. Early culturing in Chinese waters produced small, elongated specimens still referred to as ‘rice krispie’ pearls, for the obvious reason that they look like the breakfast cereal. Through the intervening years, extensive research, cross-breeding, and experimentation, we now have a remarkable variety of cultured pearls available. Freshwater cultured pearls are grown in sizes, shapes, and colours we could not have imagined a few years ago. Freshwater cultured pearls are getting brighter and more lustrous every year. Also, their colours are changing. We now see natural peach, pink, and bronze colours, plus a whole spectrum of dyed hues. Conventionally, freshwater pearls were cultured without a bead, but they are increasingly being grown with a mother-of-pearl bead inserted, like the traditional saltwater cultured pearls. The insertion of a bead allows for production of cultured pearls in more controlled shapes. In addition to round pearls, I have seen cubes, stars, and lots of different geometric forms. Freshwater cultured pearls remain very affordable. This is due to their large-scale production, and also to the fact that while saltwater cultured pearls are grown on a one-pearl-to-one-oyster basis, freshwater varieties are cultured with sometimes 20 or more pearls in a single shell, and they grow fast. Freshwater oysters used for culturing have shells about the size of a dinner plate, so there is lots of room. Also, once the oyster has produced its pearls, it can be put back to produce another batch. You could theoretically have an entire necklace from one oyster. Instead of viewing pearls as being either too rare to create a market or too grandmotherly to interest consumers, we just need to look at all that is out there. 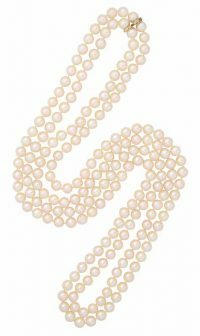 You might keep some of all kinds of cultured pearls on hand, but the growing market seems to be the modestly priced and approachable range of freshwater cultured pearls available. Traditional Japanese akoya cultured pearls will always have their place. They are classic and elegant, and what else do you wear to a wedding? They go with any occasion and are a step up from the other pearls because they are conventionally brighter in their lustre and have greater iridescence in the surface. Also, South Sea cultured pearls are large and lovely in a range of colours. These pearls have even been faceted, producing a totally different look and potentially another market for the unique-looking gems. 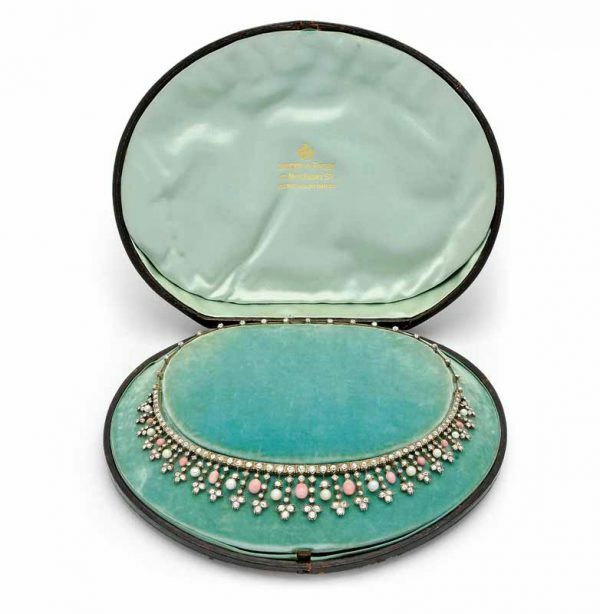 A rare antique conch pearl, pearl, and diamond necklace from the late 19th century. However, with the younger demographic, you will likely be better able to create interest in the fashion-forward colours, shapes, and sizes of freshwater cultured pearls. The price is also more likely to suit most people’s budgets. Rather than keep away from pearls, perhaps it is time to bring in the fun element and expand your market. However, you might want to keep varieties with different price points in different parts of your store, to differentiate appropriately priced classic from modestly priced ‘fun’ pearls.